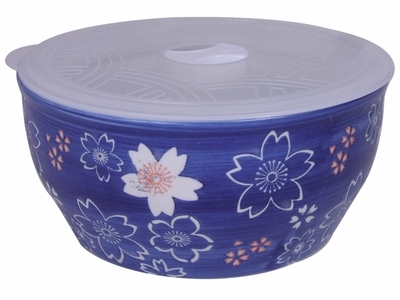 Dishwasher and microwave safe, this bowl with lid features delicate motifs of white cherry blossoms with pink accents and is the perfect size to enjoy individual servings of ramen, cereal, soups, stews, or salads. Made in China from quality ceramic, this bowl with lid is mostly a dark blue and has white cherry blossoms decorated all over the outside in various sizes and shapes. Cherry blossoms are one of the most loved flowers in Japan as they are admired for their beautiful but short bloom. Keep this beautiful image on your dining table forever with this stunning Asian bowl. With a smooth and glossy glaze all over, the white portions of the cherry blossoms on this bowl with lid are unglazed and expose the natural ceramic that this bowl is made from. The inside of the bowl is a simple glossed white and a fitted plastic lid fits over the top of the bowl for easy storage of leftovers. The plastic lid also has a small switch to open and close the vent on the top center to either steam or store your food. Packaged in a paper box, this bowl with lid is the perfect gift for students as they can enjoy home cooked meals or leftovers at school or work in a stylish microwavable bowl.